1	Preheat the oven to 200°C, gas mark 6. Line 2 large baking sheets with baking parchment. Cut each aubergine lengthways into very thin slices (discarding the first and last slices as these will be mainly skin) to give about 10 slices from each. Place in a single layer on the baking sheets and brush with half the olive oil. Season and bake for 15 minutes. Turn the slices over, brush with the remaining oil and bake for a further 5-10 minutes until pale golden. Take care not to overbrown the slices or they’ll be too crisp to roll. 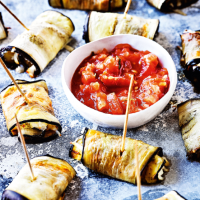 2	Combine the tomato paste, garlic and oregano, and spread very thinly over the aubergines. Sprinkle with the cheese and roll up, starting from a thin end. Secure with cocktail sticks and place on a baking sheet lined with clean baking parchment. Chill for up to 24 hours, or until you are ready to reheat. 3	To serve, preheat the oven to 180°C, gas mark 4. Bake the wraps for 6-8 minutes to heat through. Transfer to a serving plate, along with a bowl of the tomato salsa for spooning over. 0.8g salt - making 20. This recipe was first published in Thu Nov 30 12:39:10 GMT 2017.